The 10×10-funhouse-castle is the perfect amount of bouncing fun for an event. This spacious bounce house provides more than 200 square feet of pure bounce, plenty of room for participants to jump their way through the day! Jumping is a great way to promote healthy activity for kids of all ages and will keep kids entertained for hours on end. Give your children a special gift that they will remember for years to come. You will appreciate the smiling faces a bounce house creates. Find yourself enjoying the party as a host you will be amazed to see how “Busy Kids Make Great parties”. 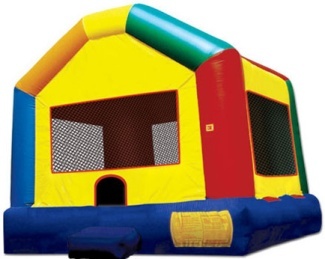 This standard 10×10 foot Jumping Castle sometimes called Moonwalk or Bounce House. It will fit even a small yard.